If you are living in a remote location where grid power is not available you would be familiar with the portable 600W or 1200W-rated gasoline generators. These are good enough to power up few fluorescent lamps, a couple of table fans, and your radio/TVs. Sorry, no air-contitioners please. Save the petrol and go for the sun instead. Because HHV Solar (India) may have just helped you with what you need - a sustainable power supply without the need to re-fuel. A suitcase you can bring anywhere? Not quite, it weighs 415 kg - not really portable. Pic: HHV Solar. 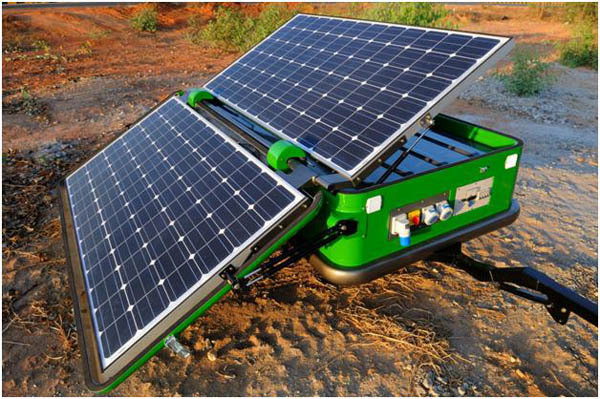 A leading solar module manufacturer, HHV Solar Technologies, in April 2012 announced the launch of its revolutionary solar device called Solarator, a trailer-mounted, solar PV power generator ideally suited for remote locations and as an emergency power source. The company claims that it is the first such product developed in India and the big advantage of the Solarator is that it is a “green” power device. 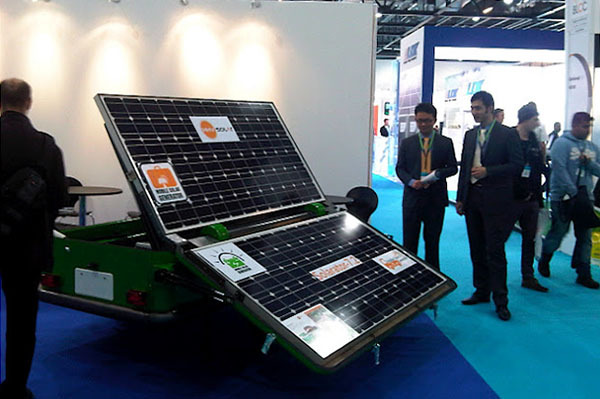 The Solarator was displayed at the London Solar Energy Exibition as reported by Syllogic. It consists of 2 high efficiency solar modules, each of which can generate 300 Watt of electricity. The modules utilise mono crystalline silicon cells which convert sunlight into electricity. During transport, the modules are folded compactly and at the site, unfolded to catch the sun’s rays. The generator and the two-wheeled trailer on which it is mounted, together weigh only 415 kg which makes it easy for the system to be hauled or even air-lifted to remote places. A completely sealed water proof compartment at the bottom of the trailer houses all electronics and electrical, to avoid any short circuits. This compartment also has space for luggage/camping equipment which needs to be carried along. - HHV website. Price : Estimated 3.5 lakh (US$6,500) although yet to be fully commercialised. Thanks to innovation, we can have more 'fully-functional' portable solar power generators; not just some solar-powered lantern lamps for the remotely located folks. With the many solar module manufacturers in Malaysia, there should be some innovations somewhere by some practical guys. How I wish I am in the solar photovoltaic industry. Note: Pictures are from HHV Solar website and Syllogic whose active links are provided in the respective images. Instead, I have thought of DIY myself solar cell before. Somehow never put the thought into action. This is the Solar panel i saw at Halogilat train station,used for lighting and computer. @thomas - that's classic! Solar array to the bare minimum. Where was this? Overpriced. 600W does not cost USD$6500. Who are they trying to con? Reprice PLEASE or this 'Solarator' is 'Terminated' before starting. Gloss is not value for money. Disappointing! I like the concept. Much safer than a fuel-run generator.